The Governors’ Highway Safety Association wants you to know it’s working really hard on pedestrian and bicycle safety. The coalition of state road safety agencies just put out another report in a series of well-intentioned but off-base attempts to draw attention to the issue. In Everyone Walks: Understanding and Addressing Pedestrian Safety, GHSA notes that pedestrian deaths have increased 15 percent since 2009 and recommends a “3 E” approach — engineering, enforcement, and education. Except, forget the engineering part, because GHSA’s members — state highway safety offices — “are tasked with tackling the behavioral side of traffic safety — laws and their enforcement, and education — but do not usually handle infrastructure or engineering,” according to spokesperson Kara Macek. So the 21 recommendations in the report barely touch on infrastructure, arguably the most important factor in making streets safe for everyone. 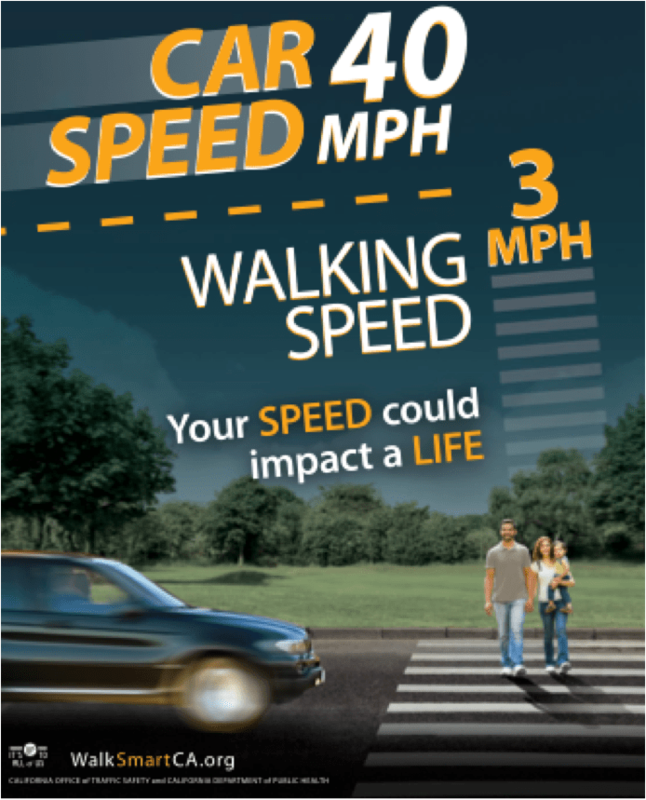 This California PSA puts the responsibility where it belongs: with the driver going 40, not the family walking 3 mph. There are some worthy ideas in there too. 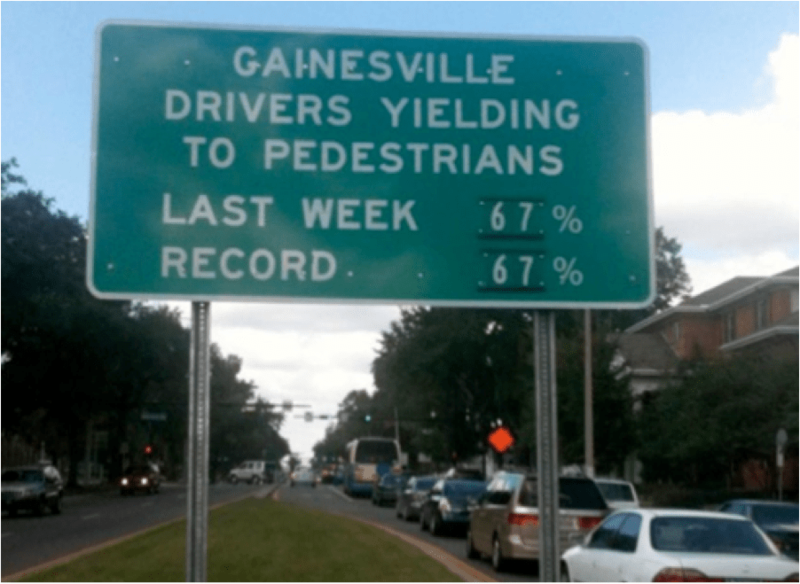 Gainesville, Florida, planted pedestrian decoys to catch drivers who don’t yield, and they installed feedback signs at key sites showing how many drivers are yielding appropriately. By letting drivers know how they were doing, Gainesville improved yielding rates by 26 percent. And Washington state earmarks traffic camera revenues in school zones for pedestrian safety projects, and the Seattle police department’s Aggressive Driving Reduction Unit works to reduce speeding, failure to yield, and distraction. The Look Alive Louisville campaign received a $307,000 FHWA highway safety grant to focus enforcement on dangerous, wide arterials with few crosswalks. While the city hasn’t been immune to pedestrian-blaming, Louisville also appears to understand that people get hurt because there aren’t adequate crosswalks or the street wasn’t well-lit. The city is working on improving the built environment for safety, including pedestrian medians and new sidewalks, though that’s not covered by the grant. 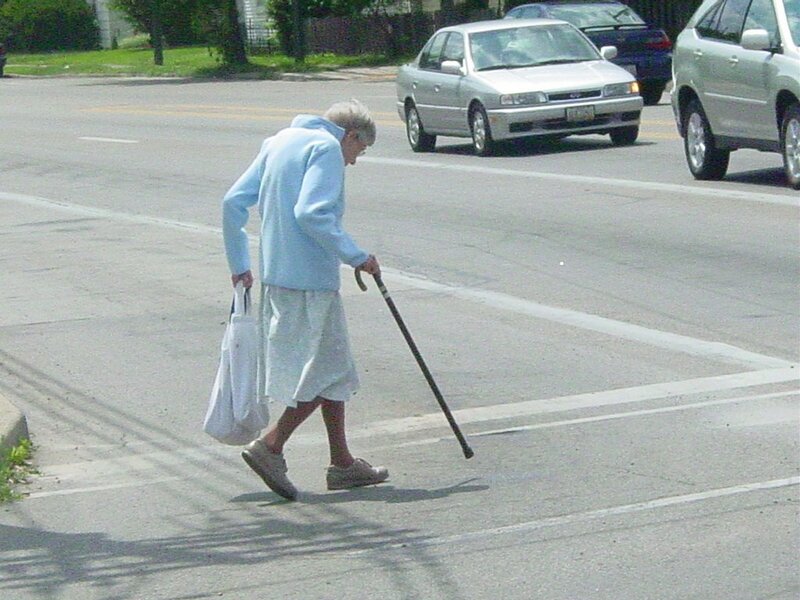 The elderly are disproportionately killed when walking legally through crosswalks. They are also disproportionately not smartphone users. 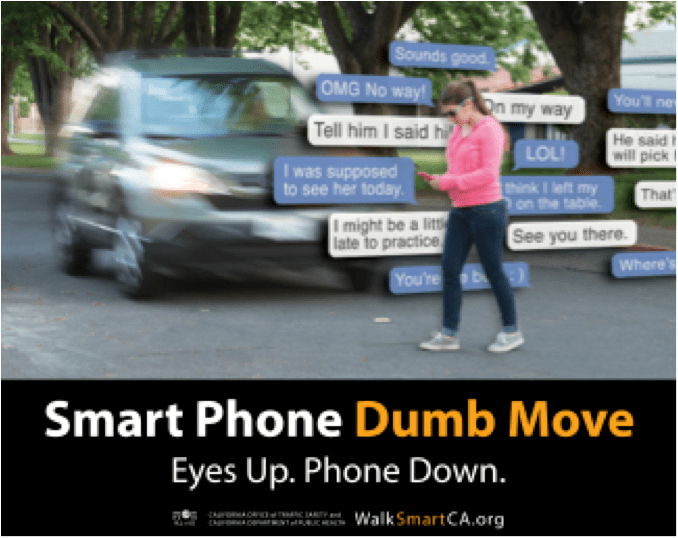 It’s a bad idea to cross the street while looking into a device, not victim-blaming. Stay alert while crossing the street. One morning while having coffee on my front porch, I saw two women gazing into their devices walk into each other. There are numerous incidents in Chicago where sexual assaults and robberies happen when the victims are gazing into their devices and not paying attention to their surroundings. No lets not blame victims here, but god, use some common sense. Or don’t people teach their children to look both ways before crossing the street. I’m not keen on blaming pedestrians for being hit by drivers failing to yield at intersections, but personally I advise everyone to put down their phone when crossing, if only to take away yet another excuse a bad driver might try to use for hitting pedestrians. Don’t look at your phone while crossing the street because that is EXACTLY what the driver who will run you over is doing too! drivers are ignoring the law..but you expect pedestrians to look both ways? Certainly you are correct about drivers responsibilities to pedestrians. But being right and being dead or severly injured is small consolation. My contribution when crossing the street to my safety is to be totally aware of my surroundings and not taking needless risks like being inattentive with an electonic device. Given that motorists are apparently given a blank check to kill anyone they like in New York City, and probably several other cities, it’s absolutely offensive to spend any time at all criticizing pedestrians. Probably the safest thing to do is to set up Jersey barriers and tire-slashers on any street, to reliably stop cars, before crossing the road. What, you say that’s not legal? Huh, then why are motorists allowed to get away with simply blowing through crosswalks? When it comes to people being killed in crosswalks, the problem is 100% the motorists.